If you follow me on Instagram or any of my other social media platforms you will know John and I recently headed up to Durham for a weekend adventure and some much needed child-free time and to explore a city we hadn't been to before. We had been invited by Hotel Indigo Durham to spend two nights in this Northern gem of a city and to discover what makes Indigo's boutique hotels stand out from the pack. 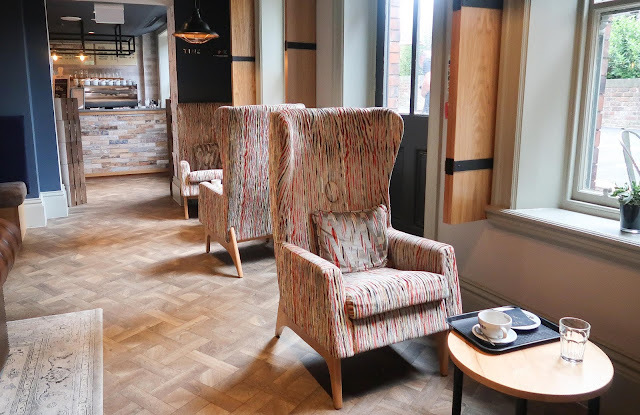 You may have seen a couple of weeks ago we tried out the Afternoon tea at the Marco Pierre Restaurant in Hotel Indigo Cardiff and have been suitably impressed with both the service and the setting so we were really looking forward to what the weekend had in store for us. 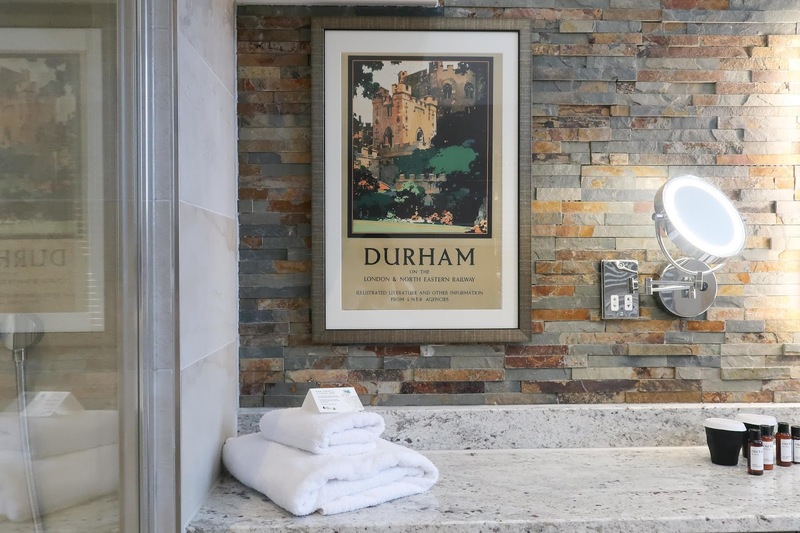 I am going to be doing a separate post on our time in Durham and what we got up to but with this post I really want to focus on the actually hotel as honestly is deserves that and you will see why. 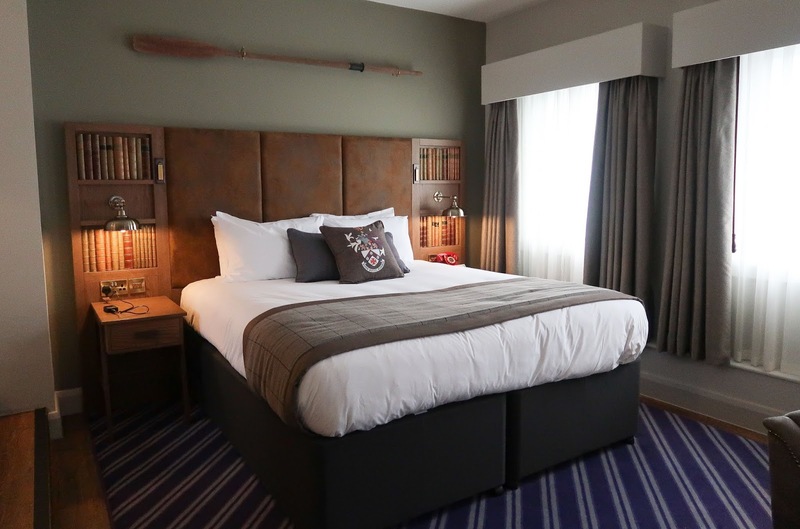 Firstly the hotel is perfectly located and is a very quick taxi ride from the station in the friendly and chic Trinity neighbourhood only a couple of minutes walk from the buzzing city centre with plenty of places to eat and an easy walking distance to any of the major sights. As soon as you walk up to the hotel you know it's going to be a unique experience as you step inside this beautiful grade listed former "Old Shire Hall" with it's imposing Victorian facade, intricate floor tiles and eye catching red brick. Check-in was a breeze with every staff member we came in contact with over our stay being friendly, welcoming and very approachable without any stuffiness you may find in more traditional hotels as Hotel Indigo really encapsulates a more modern and forward thinking ethos to travel without lacking on professionalism. Adjacent to the reception is a relaxed lounge and snug where you can catch up on some emails or have a chat with friends over coffee from the Tinderbox cafe. 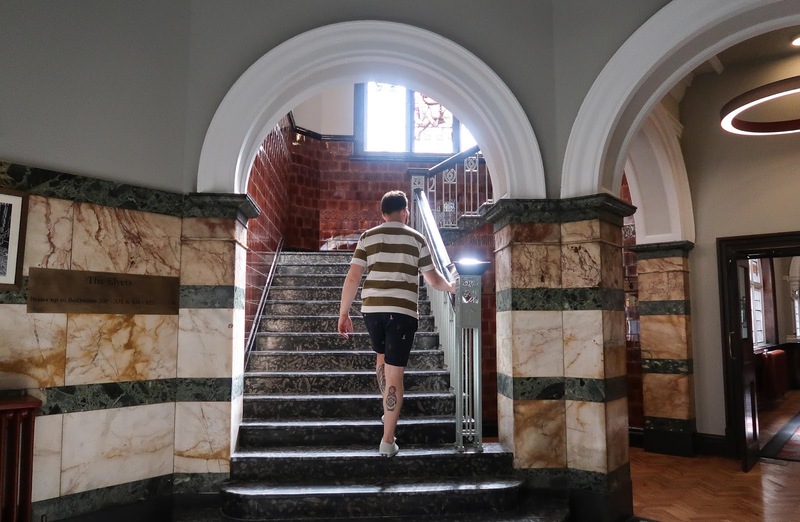 The interior here is on trend with a simple Scandi inspired design but still within keeping of the Victorian feel of the building. We then headed up to our room, as the hotel is rather large with 83 rooms spread over four floors it can take a while to get your bearings especially as it's not a traditional building in any sense and we had a lot of fun exploring all the different staircases and corridors and coming across some beautiful details such as stained glass windows and mosaic floor tiles. Our bedroom was actually right under the domed tower which could be seen from outside and our first impression was how breath-taking the space was and chic interior with a nod to academia (of which the city is famed) and of course my favourite part being the roll top bath in the natural light-filled bathroom. In terms of facilities our room had everything we needed and more with a cool coffee pod machine, a small mini bar, luxury toiletries and best of all super fast free wifi! 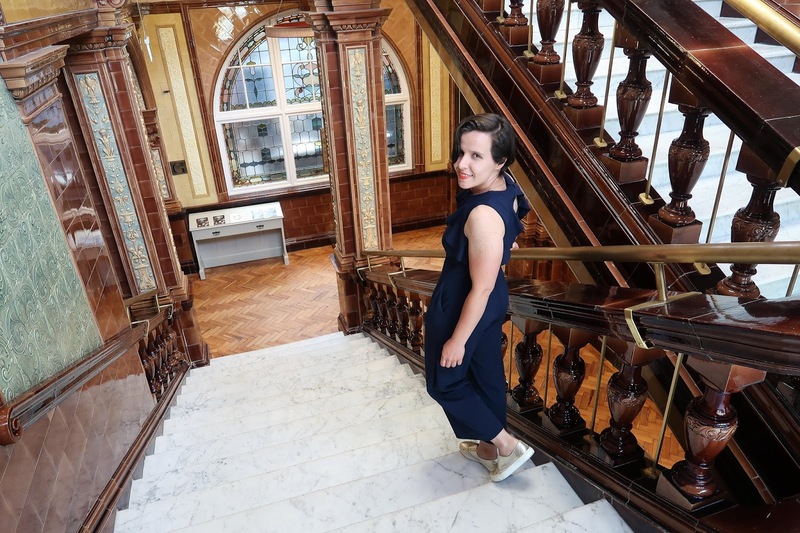 On the first night of our stay we headed down one of the most ornate staircases with marble flooring that I have every seen and made our way to the converted council chamber that is now an upmarket Marco Pierre Restaurant. 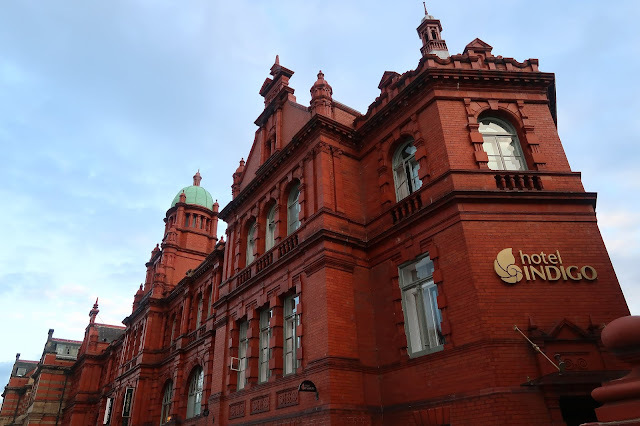 We sat upstairs with a fantastic view across the circular room and our service from start to finish was excellent and this is the perfect place for a date night or somewhere to celebrate, in fact there was a 50th birthday being celebrated that night. 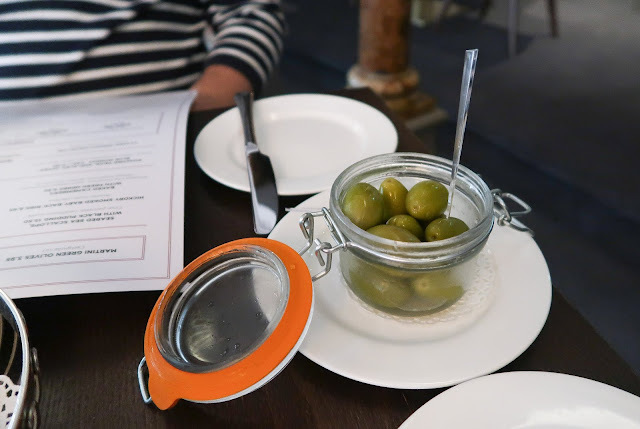 The food was also excellent and while John went for the steak I opted for the poached pear, blue cheese and endive salad and topping it off by sharing a freshly baked apple crumble and ice-cream. After our meal we had a cocktail in the bar downstairs before heading to bed as we had a action packed weekend planned. On both mornings we enjoyed breakfast in the restaurant which had a great range of cold and made to order options as well as pastries and gluten-free cakes, smoothies and fresh fruit juice. If you feel like you have overindulged from all the good food on offer there is also a small gym on site for guest to use. It's such a beautiful hotel isn't it! 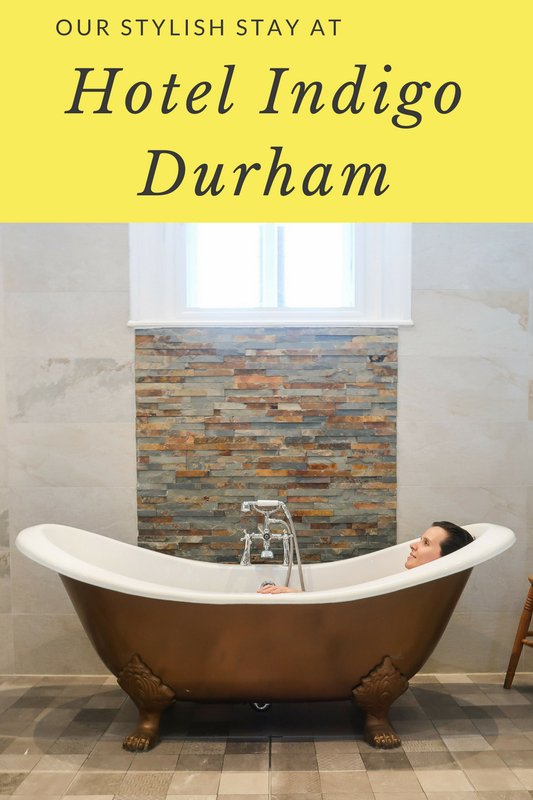 Our friend is getting married in Durham next year and I'm hoping to stay over then - that bath looks to die for! WOw!! This hotel is very Awesome and mind blowing. Thanks for sharing this attractive pictures of this hotel. What a lovely looking hotel. 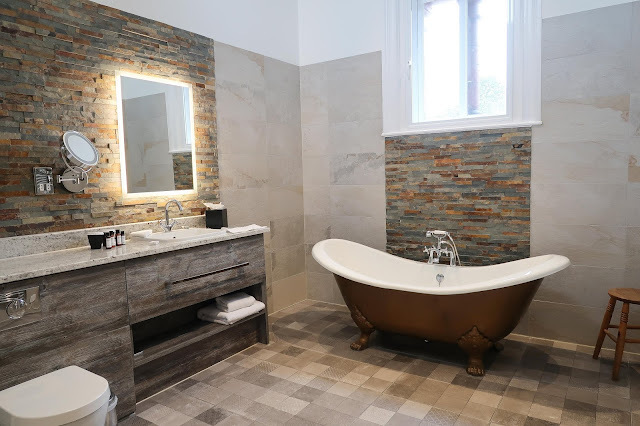 That bath tub is everything! Sounds like a fantastic hotel. It's a beautiful looking place inside and your bedroom was huge. And great to hear the staff and service were excellent.